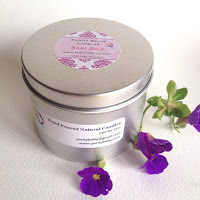 In this post I'm going to look a little bit at candle care in general and show some of my own candles, so that you can make the best use of them. 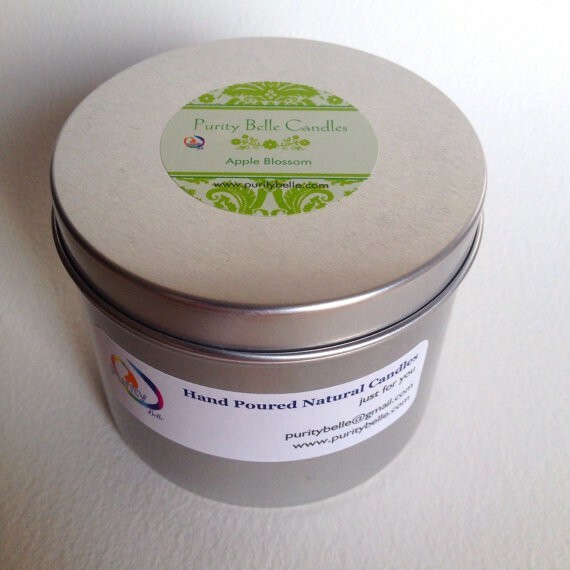 Like any other craft, candlemaking depends on excellent quality materials and care in the process of creating them. If you appreciate craft and are willing to spend a bit more for a handmade product, then of course you want to get the best value and make it last. My candles are made from pure soya wax which is a vegetable wax, produced sustainably and which gives a much better scent throw than paraffin wax, as well as being considerably better for the environment - check out some of the benefits of soya wax. 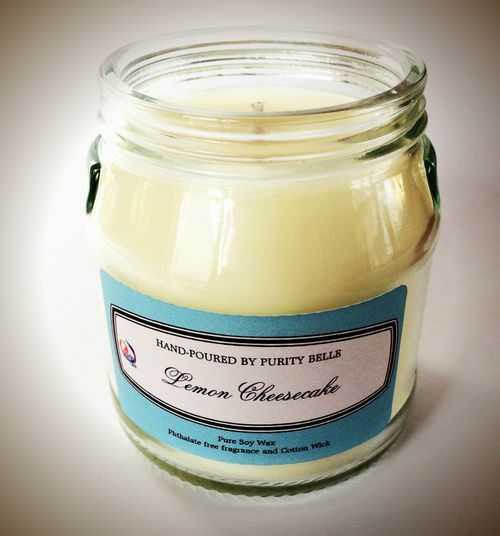 All my candles are made by hand, poured individually so that each one gets the same attention to quality. The basic premise of creating a candle is fairly simple - wax, a container and some wick! However in order to have the best finished product, there are a lot of different factors to consider. Things like pouring temperature, wick size, container size and quantity of fragrance are all things that have to be tested and measured carefully and changing any one of these things can impact the final product quite a lot. When you buy a Purity Belle Candle, you are guaranteed quality that has resulted from years of experience. So, how do you take care of your soy candle? First things first - the initial burn is very important when it comes to soy candles. 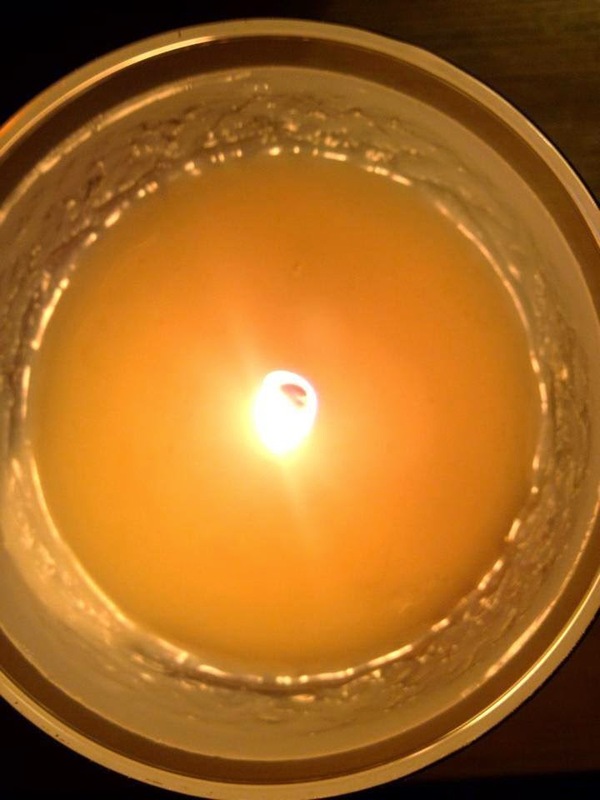 Soy wax has a 'memory', it retains the shape of the initial burn pool (the area of melted wax around the wick) so it's essential that when you first light your candle that you allow it to burn for a minimum of one hour but ideally 2 hours or until the burn pool reaches the edge of the container. This means that when you next light it, the same burn pool will be recreated and you won't get the 'tunnelling' effect you get with some cheaper candles. If the candle has this kind of tunnelling, you will lose a lot of the scent and a great deal of wax is wasted. Always make sure to trim the wick before you relight - many of the wicks I use are self trimming but there's usually a little thicker point at the top after burning. I normally just pinch this off with my fingers before relighting. The candle of course should be on a stable surface, not only for safety but also in terms of the candle burn. Likewise, drafts can cause the wick to flicker or edge to one side.If the wick starts shifting to one side, edge it gently back into place when the candle has cooled but wax is still soft, so that the candle continues to burn evenly. The next thing is picking the right candle for the right space. Personally I like a stronger scent in the living room and fresher fragrances for the kitchen. For bathrooms and smaller areas my favourite size is my upcycled small jar candle, it comes in different shapes and sizes depending on what's available but is usually this size. It will scent a small room without being overpowering and will last for ages. For the sitting room, my preferred candles are larger and in the more potent scents, I've been using one of my Luxury Jars in Vanilla Cream for ages and it's warm and soft, perfect for relaxing. 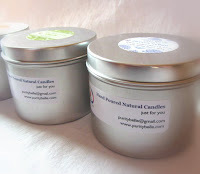 The tin candles are good for most areas, but bear in mind that most scents will be a bit lost in large open spaces so you may need to light 2 candles for maximum impact, two of the same fragrance works fine or play around with combinations - Lavender and Vintage Rose go beautifully together for example . I prefer a lighter candle fragrance for the kitchen because I don't like the idea of a strong scent overpowering the foodie smells! One I use regularly is my Apple Blossom fragrance in a tin candle, it's quite fresh and crunchy and creates a pleasant light background scent. Remember that soy wax is much softer than paraffin wax and melts at a lower temperature so spillage is never a problem and will wipe away easily with a warm sponge. Final tip for safety, keep the candle free of any debris and dust, I generally just use a small piece of kitchen roll to wipe around the candle if it hasn't been lit for a while and is getting a bit dusty. That's it for now, hope my tips will help you and Happy Candle Burning! Thank you! Great tips :) I love my purity belle candles. Best candles I've ever had. I love a nice strong smelling candle. Ive never these ones so I may have a look they look nice. I usually pick candles you light them and can't smell them! I love the ones in the tin. I love the stronger scented candles! I do love a good candle, especially at this time of year. I have never thought to trim the tip of the wick, I'll keep that in mind from now on! Great tips and lovely post. Some really good tips here! I used to love making candles as a child but haven't done it for years. I never knew there was such a difference between soy and paraffin candles! Great tips. I didn't know about trimming the tip of the wick after burning so I'll give that a try. Your candles look fab. Great tips. I only learnt about the burn pool thing recently so now I take my first burn very seriously! I adore candles and lighting them is definitely part of my evening ritual. Your candles look beautiful. What a lovely business to be in.